The unique geo-climatic conditions of the region make Assam and the entire northeastern region of India very prone to natural disasters like flood, earthquake and landslide. 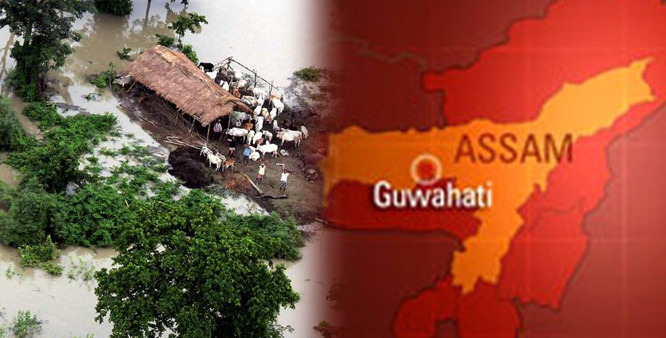 The state of Assam experiences perennial floods, river bank erosion, landslide and other environmental catastrophes. Disasters cause sudden disruption to the normal life of a society along with enormous damage to property associated with high casualty of human life. A review of the past disasters indicates that the state had to bear the devastations of two natural disasters- floods and earthquake. The floods of the Brahmaputra and Barak river systems have been variably inundating the plains of Assam in different periods. Although written records of flood in the state do not date back beyond the 13th Century, the pedologic and landform characteristics of the plains are clearly indicative of large scale actions of recurring and occasional flooding in the historic past. Historically, the people of Assam are well acquainted with floods and spontaneously they have acquired the art of living with these to a considerable extent. But, in the recent past due to a variety of newly emerging causes, in addition to the generally recognized ones, floods in both the Brahmaputra and arak valleys sometimes attained such a magnitude that they appeared to be greatly hazardous to major section of the flood plain dwellers. The nature of floods in terms of frequency of occurence during a year and the quantum of damages caused has been changing frequently. Now, in certain parts of the valleys, floods of different order occur at least 3 to 4 times a year. The precipitating factors of recurrent floods in Assam are of both natural and anthropogenic in origin. High potent monsoon rainfall regime, deforestation and easily erodable geological formations in the upper catchments, accelerate the rate of basin erosion, rapid channel aggradations, intense land use pressure, explosive population growth especially in the flood prone belt and adhoc type of temporary flood control measures are some of the dominant factors that cause and intensify floods. The most important cause of the frequent flood in this region is the extremely dynamic monsoon regime visa-vis the unique physiographic setting of the basin. Floods are not new to Assam and the people of the state have learnt to live with them. But floods have become a perennial episode after the August 15th, 1950 devastating earthquake. Wedges between two collision plate boundaries, the Himalayan in the north and the Indo-Burman in the east, Assam and for that matter the entire Northeastern India is seismically a very active region of the world. . Precisely, the Indian subcontinent lies upon the Indian Plate. This plate is moving northward at about 5 cm per year and in doing so, collides with the Eurasian Plate. Upon the Eurasian Plate lie the Tibet plateau & Central Asia. This mammoth collision, leading to the formation of the Himalayan and the Indo-Burman mountains has great impact on the crustal movement of the region. As such, the structural deformation, high seismic activity, and positioning of the mountains, the drainage systems are all controlled by these tectonic movements. The region has a complex geotectonic set up of the region because of the juxtaposition of three distinct tectonic elements – the Himalayan tectonic zone, the Indoburman orogenic belt, and the northeastern promontory of the Indian Shield comprising the Shillong - Mikir Plateau and the concealed part beneath the Brahmaputra valley. The intensive seismic activity along the Indoburman belt is a result of under thrusting of the Indian plate beneath the Burmese plate along a well-defined Benioff zone with dips 30-40 degrees. This region has been under continual threat from major earthquakes and the subject has assumed serious attention of Government and public and has been seriously debated in national and international forums. Besides the two great earthquakes in 1897 and 1950 measured 8. 7 on Richter scale there are as many as twenty earthquakes of magnitudes 6. 0 to 7. 0 occurred in this region during past 100 years. Although seismically stable Assam valley constitutes the most vulnerable one because of the thick sedimentary cover. Any earthquake occurring in the neighbouring seismic zones,like the Himalayan tectonic zone, Indoburan belt, Shillong Plateau can bring unexpected damage to the valley. The vivid example was provided by the 1897and 1950 earthquakes where the alluvial plains suffered extensive damage in the form of ground rupture and liquefaction. Extensive landslips on the Himalayan slopes, increased sediment loads, large scale liquefaction in valley, changes of river course and configuration of the Brahmaputra itself, were some of the outcomes of this earthquake. In Lower Assam the effect of the 1897 event was considerable.